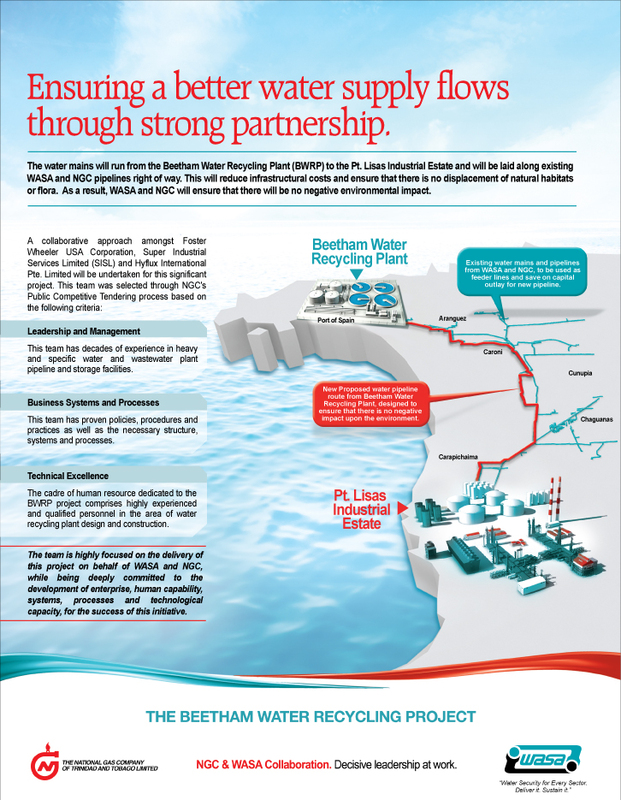 The Project is in two stages – to Design and Build a water recycling plant at Beetham and to Operate & Maintain that plant for a period of five years. The recycled water is to be piped to Point Lisas for the cooling requirements of industrial customers, which we are told will ‘free-up’ about 10 million gallons per day of drinking water. This Design & Build contract for $1.043 Billion was awarded to SIS Ltd and its sub-contractors on 10 March 2014. Despite the attributes presented by this project, there are grounds for serious concern as to the process adopted and the actions of the various public officials involved. The Leader of the Opposition, Dr. Keith Rowley, first raised this matter in the budget debate of September 2013, following that with a formal complaint, on 10 March 2014, to President Carmona. In addition, Dr. Rowley’s Private Motion was to be debated in Parliament on Friday 28 March calling for the Prime Minister to stop the project and investigate the matter. Having considered the available facts, the JCC issued a Press Release on 20 March 2014 calling for the project to be immediately halted. The JCC is also calling for an independent public investigation into this entire matter. The project is not mentioned at all in the 2014 national budget. It is not in the Budget Statement or any of the supplementary documents which record the figures for State Enterprises (such as NGC), Statutory Corporations (such as WASA) or the overall national accounts.That omission itself is grave enough to warrant a complete halt to this dubious operation, but that is not the worse of it. Not at all.When one carefully considers the 2014 budget, two even more serious issues become apparent. The first is the timeline. 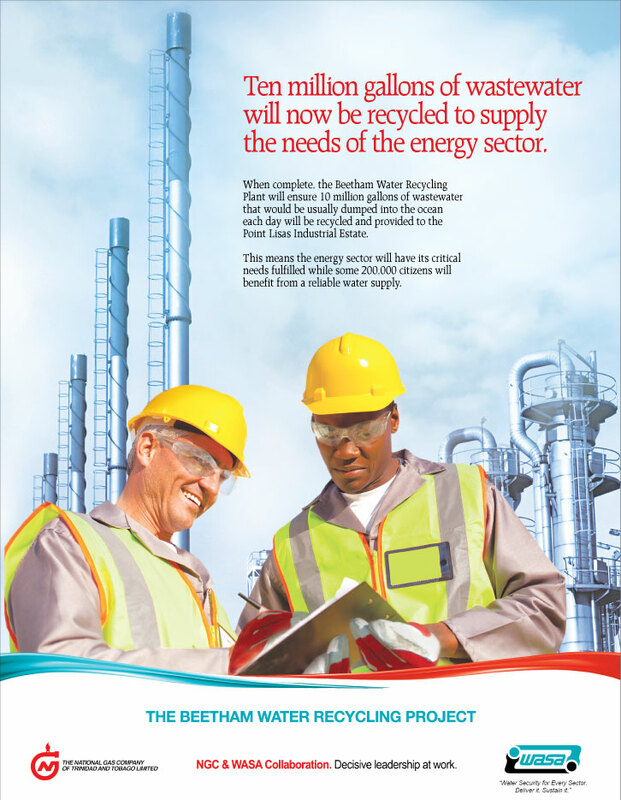 The NGC published the Request for Proposals (RFP) for this huge project on Monday 2 September 2013. The 2014 budget statement was delivered by Minister of Finance & the Economy, Larry Howai, on 9 September 2013. So, the Minister of Finance & the Economy assured the nation that we are well on the way to ‘Water for All‘, only one week after NGC published that RFP. That sequence of events raise fundamental questions as to just what reliance we can place on our national budgeting process. Reports which are silent on large-scale proposals are unreliable. For our national budget to slide into that category of unreliable document is unacceptable. What is more, Minister Howai’s statement as to the nation’s water supply and WASA’s intended projects really give us cause for a pause. If the Minister’s statements are reliable, why do we need this project? If those statements cannot be relied upon, we are really at a sobering moment. The State Enterprises Investment Programme (SEIP) is an integral document in the national budget, which shows all capital infrastructure projects financed by State Enterprises and Statutory Authorities. 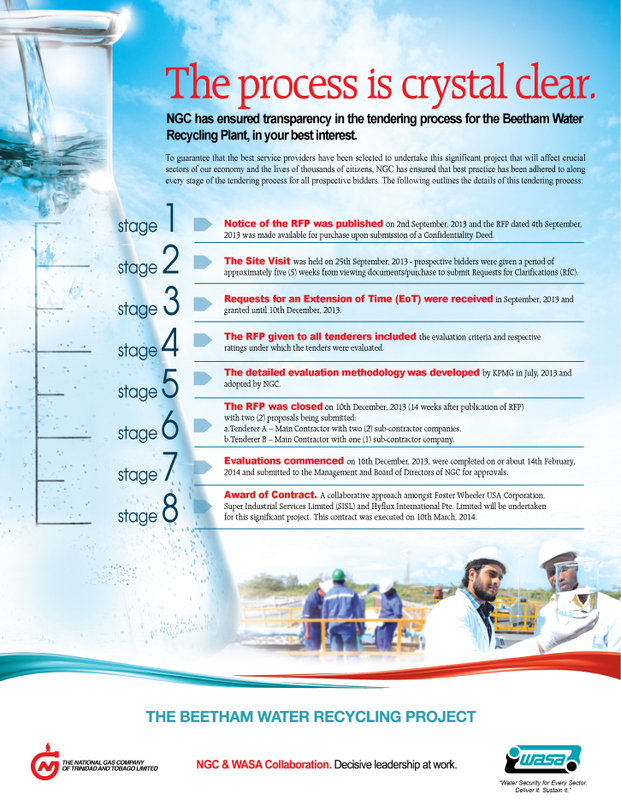 NGC’s projects are detailed at pgs 8-12 of the 2014 SEIP, but there is no mention of this Billion-dollar Water Recycling Project. 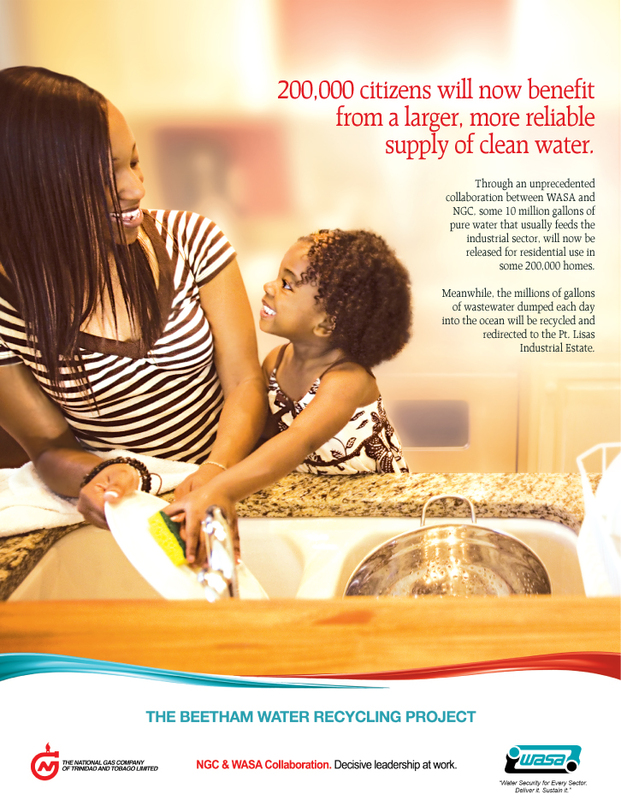 The silence in the budget as to the Beetham Water Recycling Project is unacceptable. It raises the direct question as to the reasons for the actions of these public officials. It is unacceptable that a project of this size and consequence could be conceived and implemented as a ‘phantom project‘. This is a mammoth ‘off-budget‘ expenditure to be funded by Public Money, via the NGC. Apart from the ‘off-budget‘ issue, there is also the burning question as to the choice of the delivery agency. WASA was reported to have obtained a $246M USD loan from the Inter-American Development Bank (IDB) in February 2013 for local wastewater management, to include this project. No reason was advanced for the decision to resile from that course of action in favour of the current procedure. WASA is the Statutory Agency responsible for our country’s water supplies and sewerage, while NGC is the State-owned company established to manage the distribution and sale of our country’s natural gas. The JCC is questioning the reason for the participation of the NGC in this water treatment project. The Chairman of WASA, Indar Maharaj (who is also the CEO of NGC), stated that WASA did not have the money for the project as a way to explain how NGC came to procure these water treatment facilities. The role of the Minister of Finance & the Economy is crucial in this matter, as that Minister has the authority to secure funding from either the IDB loan or other State resources, such as NGC, to have the project implemented by WASA. 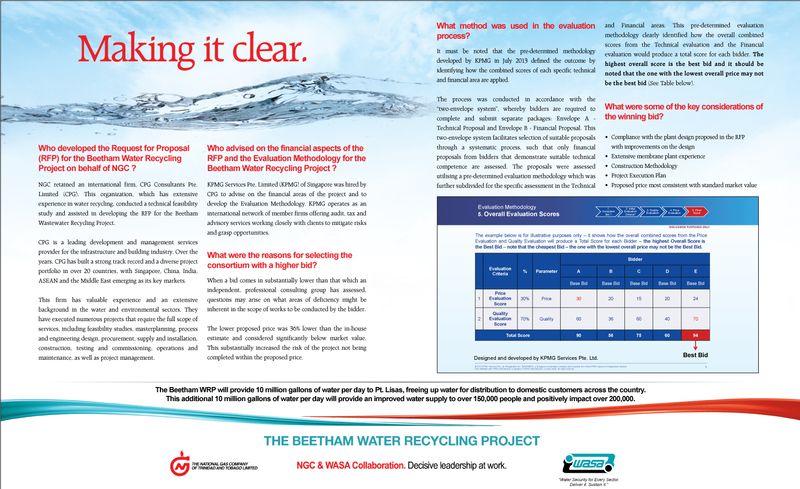 The choice of NGC as the implementing agency for this Beetham Water Recycling Project is one which has serious implications in terms of oversight. The implementation of this project by WASA would have required the involvement and supervision of the Central Tenders Board. What is more, since the project would have been proceeding via a Statutory Authority, the tendering and appraisal procedure would have been open to challenge by means of a judicial review. As things stand, after the Appeal Court decision in NHIC v UDECOTT (#95 of 2005), NGC, as the State-owned Enterprise implementing this project, is shielded from judicial review in its commercial contracting operations, unless evidence of fraud or illegality can be produced. What are the Commercial fundamentals? Was a Needs Assessment carried out for this huge project? The 2014 budget detailed WASA’s significant pipeline renewal programme, which is expected to result in a significant reduction in the wastage of potable water. Desalcott is undergoing a 25% expansion in its output of potable water, from 32M gallons daily to 40M gallons, due for completion in April 2014. So, just what is really the plan? The JCC is noting its grave concern that no Business Case seems to have been made for the advisability of this large-scale project on grounds of a value proposition. The long-term, underlying contractual arrangements which are driving this project remain obscured. 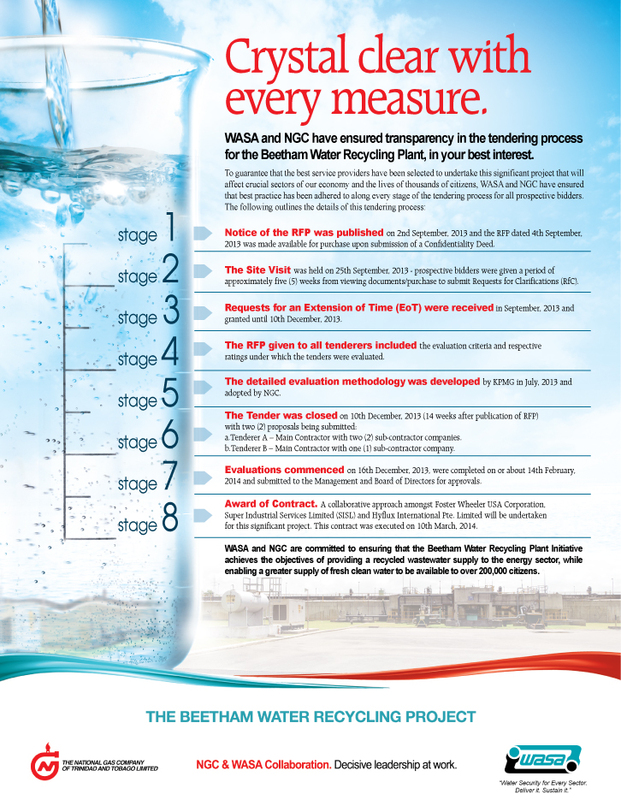 Do these proposed arrangements improve or further diminish WASA’s financial standing? Do they benefit NGC and to what extent? What is the financial impact of these proposals on our country’s fortunes? Despite the strong protests from the PNM on this matter, the JCC notes that the Opposition’s position on Public Procurement reform is unknown. The continued efforts by our Private Sector/Civil Society group to engage the PNM in dialogue on this question have been fruitless. The lawful circumvention of our country’s oversight provisions in this matter is glaring. This situation amounts to a deliberate choice by public officials to take the path to obscurity, with diminished transparency in the execution of this huge project. Sad to say, that much is ‘Crystal Clear‘. I will begin by congratulating Afra on a great article and more so for his tenacity and keeping the debate constructive, critical and alive. We must save our country! What becomes crystal clear upon examining the chain of events is that our nation is caught in a downward spiral – the start of which long predates 2010. What the facts amplify is a thorough absence of a National Planning Infrastructure. If we were planners and wanted to be rigorous and disciplined (especially as it involved spending public money) we would begin with a national strategic plan which will clearly outline where we want to go over the next 10 – 15 years. In such planning, there will be a needs assessment and a determination of where our current resources will take us. For example, we will not be confused by statements like “we are self-sufficient in water, then see a massive project to assure water supply” (so a proper analysis was not done somewhere). As an outshoot of this our annual budgets will flow as each budget will represent proposed spending against a defined future and it will give the population a sense that there is some idea of directionality. The budget so developed will then be reviewed quarterly by the Planning Ministry to ensure that we are on track with our milestones and delivery. This situation will present no surprises. But Afra’s article describes a surprise and we are left to wonder ‘how come the bright men and women who run our country cannot see the need for structure and process?’ As Trinbagonians we have become lazy and too prone to sensation, thus our first instinct is mischief. Though mischief is always a possibility in any society, we should expand the scope of our thinking to include (1) a lack of understanding of planning, (2) a lack of the technical knowledge (human resources) to develop plans, (3) the burden of short-sightedness which makes us think only in five-year increments further complicated by tribalism. The issue with the project is not that it will not support our national development or alleviate stress on a large part of our society that does not have 24 hour water supply, but is the apparent lack of alignment of plans, objectives and intentions. If there was some structure and we as John Trinbagonian could see why/how spending $1B plus will benefit us and even better if we were included in the debate even if just to listen, we would feel better. In our history we have never had this luxury. 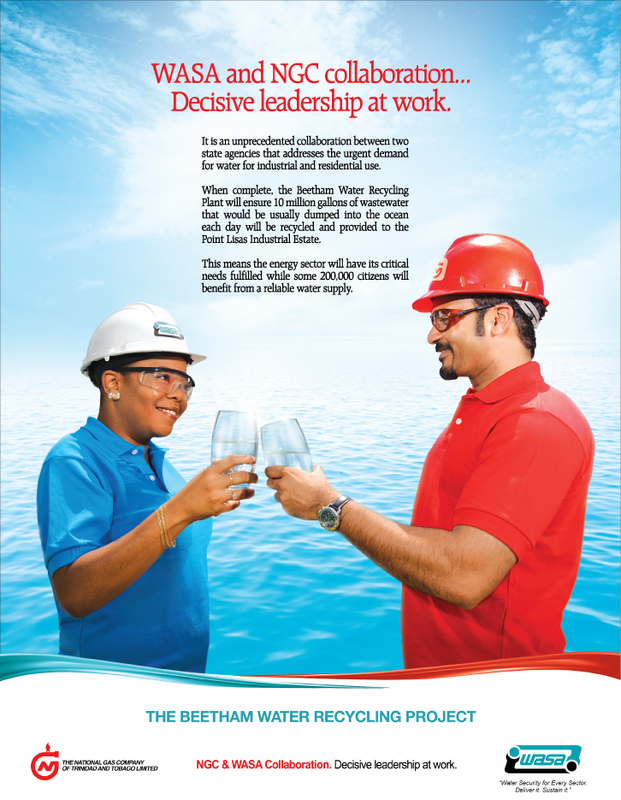 Further, who is accountable and answerable – WASA or NGC? Our problems are a combination of all four possibilities described previously. And we are prevented from course adjustment because as a country we have decided not to engage help or seek analogs when needed (we always think we know it all), to ignore Lloyd Best’s call for deep critical analysis and not to engage in proper reform – constitutional and electoral. Maybe a quick glance at the USA National Security Strategy signed by president Obama in 2010 will prove insightful. That policy takes a holistic view and sees security as taking care of its people and interests. There is a consideration of strategy outlined in a Strategic Approach, Advancing Interests (which includes security, prosperity, values and international order) and a Conclusion that starts with a call to innovation and capacity, openness and moral imagination. Within the discussion of prosperity there is a comprehensive discussion of “spend taxpayer’s money wisely” – that’s where we should start because indeed we are eroding our national patrimony! And yes, I do believe in learning from others!! In my other contribution I will discuss how ‘the fish rots from the head and so does a nation’ and how/why we will never solve crime.